Cortec VpCI-126 HP UV Shrink Film combines high strength resins with ultraviolet light stabilizers (UV) and Vapor phase Corrosion Inhibitor (VpCI) technology. This state-of-the-art film construction provides multi-metal protection for parts, equipment and vehicles for up to three years, even in aggressive outdoor conditions. Unlike some preservation films that rely on white pigments to reflect UV light, VpCI-126 HP UV contains unique inhibitors that protect the polymer from UV exposure and prevent degradation. VpCI-126 HP UV is ideally suited for transit, staging, and lay-up of critical equipment; including equipment with large void spaces, multiple metals and complex geometries. 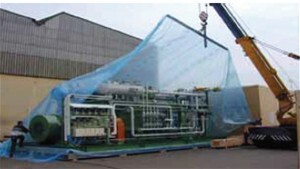 VpCI-126 HP UV Shrink Film can replace conventional rust preventatives such as oils and desiccants. Parts protected with VpCI-126 HP UV are ready to use with no additional cleaning and/or degreasing necessary, saving you time and money. VpCI-126 HP UV Shrink Film is also transparent, making it easy to identify parts without compromising your package. Metal parts packaged in VpCI-126 HP UV Shrink Film receive continuous protection against salt air and humid environments, moisture, aggressive industrial atmospheres, and dissimilar metal corrosion. The VpCIs vaporize and condense on all metal surfaces within the enclosed space. VpCIs diffuse to every area of your part, protecting its exterior, as well as void spaces and recessed areas. Equipment is completely protected from corrosion during storage, lay-up, and staging as well as during domestic and overseas shipments. The shelf life of VPCI-126 HP UV film is 2 years. .
Cortec VpCI-126 HP UV Shrink Film is available in 10 mils (250 microns) thickness and 20' x 100' (6.1 x 30.5m) rolls.